[Review of] William Dalrymple and Anita Anand's "Koh-i-Noor: The History of the World's Most Infamous Diamond"
The following review is illustrated with images from our own website (except for the first, which shows the cover of the book under review). Click on them for the essays in which they occur, and for more information about their sources. "The Jewel in the Throne"
At the beginning of his history of the fabulous Koh-i-Noor diamond, William Dalrymple reports that “until the discovery of diamond mines in Brazil in 1725, with the sole exception of a seam of diamond crystal fountains of Borneo, all the world's diamonds came from India" (19). Inevitably, then, much of what follows takes place on the subcontinent. In the first section, entitled "The Jewel in the Throne," Dalrymple guides us through this early part of its story with his usual flair. Legend has it that diamonds were first mined in the southeastern state of Andhra Pradesh. In pre-historic times, Lord Krishna was associated with the gem and Dalrymple ably narrates the various stories and myths in which diamonds are involved. They feature even in in the Hindu religious texts, the Puranas, which were subsequently studied in great detail. There were also the ratnashastras, texts concerned with the science of gems. Dalrymple explains that the gems "do not just appear in the mythology and manuals of ancient India, they are also an almost obsessive theme in ancient Indian plays and poetry written in Sanskrit”; even austere Buddhist literature, with its insistence on poverty and denial, “is pervaded with gemmological imagery” (26). In these ancient times, diamonds were believed to have been embedded in the carved eyes of gods in South Indian temples. India became famous for such treasures, and when the Muslim invaders arrived, they were entranced. The most famous of all the diamonds in India was called the Koh-i-Noor, meaning “Mountain of Light.” As Dalrymple admits, its early history is complex and conjectural, but at last it reached Babur (1483-1530), a descendant of Genghiz Khan who conquered Central Asia and established the Mughal Dynasty in India. He, then, was one of the first possessors of the Koh-i-Noor. Subsequently, the gem passed on to the Mughal Emperor Shah Jahan who embedded it in his Peacock Throne. In the declining years of the Mughal Empire, Nader Shah of Persia attacked the country. He looted the Peacock Throne, and acquired the Koh-i-Noor. It eventually fell into the hands of Afghans from whom it was retrieved by the Sikh ruler, Maharaja Ranjit Singh. It was he who made Koh-i-Noor extraordinarily famous. He showed it to various jewellers who all certified that it was a unique gem. Ranjit Singh took great care of it, and throughout his life maintained its safety and integrity, regarding it as a symbol of the expanding empire of the Sikhs. 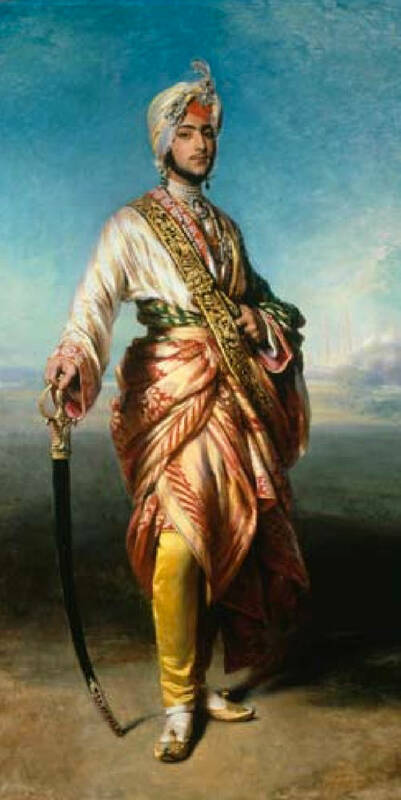 According to Dalrymple, after coming to the throne, Ranjit Singh, who “had won back from the Afghan Durrani dynasty all the Indian lands they had seized since the time of Ahmad Shah ..., and "conquered all the Durrani territories as far as the Khyber Pass ... seems to have regarded his seizure of the Durrani's dynastic diamond as his crowning achievement, the seal on his status as the successor to the fallen dynasty” (120). On 17 August 1835, however, he suffered from a massive stroke and died soon afterwards. 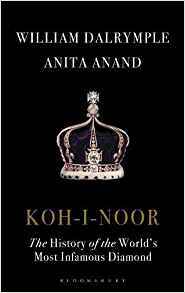 Anita Anand, Dalrymple's co-author, takes up the story of the Koh-i-Noor from this point onwards, as it comes into the hands of the British. We are on safer territory here, where historical facts can be verified. She starts by relaying a graphic contemporary description of Ranjit Singh's funeral, in all its gruesome detail. It was attended by thousands of mourners who watched (and smelled) the burning of a famous Maharaja: the palace was filled with “the scent of burning flesh and sandalwood." Anand draws on “comprehensive accounts of the numerous ceremonies performed for the dead king” (139). These included the rites that his various wives (now widows) went through, culminating in "sati" — dying on the burning pyre of their dead husband. As for Ranjit Singh's army, it fell into disarray. Strangely for a Sikh, before he died, Ranjit Singh had expressed the wish that his most precious possession, the Koh-in Noor iself, should be given to the sacred Hindu temple Jagannath in Puri, a town situated in Odisha on the eastern coast. The temple had been built by the legendary Hindu King Indrayamuna. But Ranjit Singh's eldest son Kharak Singh who had “grown up seeing his father with the Koh-Noor strapped to his biceps” (147), decided otherwise. Although he and other successors of Ranjit Singh were murdered, one after the other, the royal line clung to the royal throne — and the Koh-Noor. Finally it reached his five-year-old son Duleep Singh, as the Maharaja of Lahore. 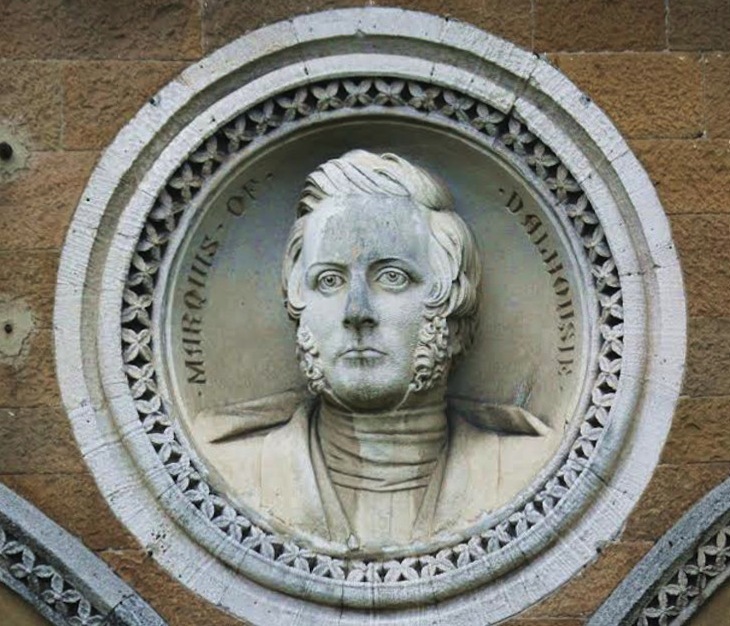 Lord Dalhousie, as he is remembered in a carved medallion on the façade of Mumbai's main station. This is the point at which the story of the diamond enters on a new phase, and becomes a contentious one involving the British. The colonial powers had grown suspicious of the power of the Sikhs even though they had defeated them in the two Anglo-Sikh wars. They took control of the young emperor Duleep Singh, and made Ranjit Singh's widow Jind Kaur the Royal Regent. She took care of the little boy and supervised his upbringing. She told him of the glories of the Sikh empire that he had inherited. Lord Dalhousie, then Governor-General of India, meanwhile felt that the Sikhs would try to regain their former glories under their new emperor, even though he was so young. Dalhousie decided to break up their empire. Consequently, the British imprisoned Jind Kaur and separated her from her son. She was not allowed to see him for about eleven years. Duleep Singh was asked to sign papers in which he handed over his powers over the Sikh regions in India. He was also made to surrender the Koh-i-Noor. Dalhousie wrote: “The Koh-i-Noor had become with the lapse of ages a sort of historical emblem of conquest in India. It has now found its proper resting place" (qtd. p. 204). It was not just a matter of asserting control: the British wanted very much to possess this jewel because this would be a welcome addition to the Crown's coffers. It had immense symbolic value too. The Delhi Gazette said: “It is hoped [it] will ere long, as one of the splendid trophies of our military valour, be brought to England in attention of the glory of our arms in India” (qtd. p. 193). 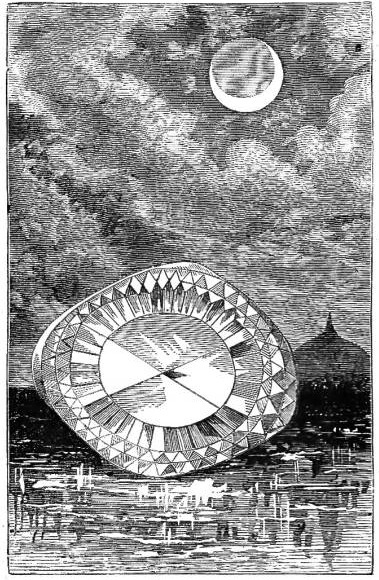 An illustration from the Harper's edition of Wilkie Collins's The Moonstone (1874), largely inspired by the celebrated diamond and the myth and mystery surrounding it. Dulip Singh himself then became a hostage: in his attempt to remove all traces of Sikh power in India, Dalhousie decided to prepare the lad for life in England. He was put under the care of the Scottish doctor, John Spencer Login, and his wife Lena. The boy was to be fully anglicised and converted to Christianity. He would not be allowed to see his mother almost till the end of her life, and became, in effect, an honorary Englishman. It is all worse than questionable, but Dalhousie believed that Duleep Singh “would in time grow to be to be grateful for what the British had done for him: "he will have a good and regular stipend, ('without income tax') all his life and will die in his bed like a gentleman, which under other circumstances, he certainly would not have done” (qtd. p.193) The damning fact is that no choice was involved: as Lloyd's Weekly noted at the time, Duleep Singh was made to sign the paper as Lord Dalhousie directed him, "quite regardless of its contents” (qtd. p. 203). Duleep Singh was, in fact, a pawn in this cruel game, played partly for the personal gain of Dalhousie. He wanted to present the diamond to Queen Victoria personally, mistakenly believing that he could take the credit of giving the jewel to the Queen. But, as Lloyd's Weekly also pointed out, he was not in a position to do so. He was merely a civil servant. He had “no legal right” (203) to make a gift of the precious gem. “The diamond, as with all else in the conquered territory of Punjab, belonged to the East India Company” (203). Finally, the Company itself claimed the doubtful privilege of presenting it to the Queen. Arrangements were soon made to move the Koh-i-Noor to England. Extraordinary precautions were taken for its perilous journey across India. Finally, it reached Bombay. Then on 6 April 1850, the gem was taken aboard the ship Medea under a seasoned naval commander, Captain William Lockyer. But the bad luck associated with its removal now became apparent. Within about ten days' of setting sail the crew was struck by cholera. So the ship first went to Mauritius, where the authorities were reluctant to accept it. After a stormy voyage, the ship finally reached Plymouth on 30 June 1850. Newspapers greeted the arrival of the Koh-i-Noor with glee, but it was not unloaded there. It went on to Portsmouth where Lord Onslow, private secretary to the chairman of the East India Company, waited to receive the gem. It was then taken to London and arrived at its final destination, the headquarters of the East India Company in Leadenhall Street. The Company's chairman, John Shepherd, accepted the gem on behalf of the queen. However treacherously acquired, it was now in the very heart of Victorian England. Yet there were still problems. While all this was going on, Queen Victoria had to visit her dying uncle in Cambridge House in Piccadilly. After the visit, while she was leaving the house, the Queen suffered one of several attempts on her life: a smartly dressed man approached the carriage, and “struck her head with a thin black cane. The blow was hard enough to crush her bonnet and draw blood” (214). Another ill omen, perhaps? The attacker, Robert Francis Pate, who was an ex-army officer, appeared to have no apparent motive. Then, two days later, when the queen wrote in her diary that the Koh-i-Noor was presented to her by members of the East India Company, she seemed personally unimpressed by it: "Unfortunately it is not set 'à jour,' & badly cut, which spoils the effect," she wrote in her journal (qtd. p. 216). The India Court in the Great Exhibition of 1851. 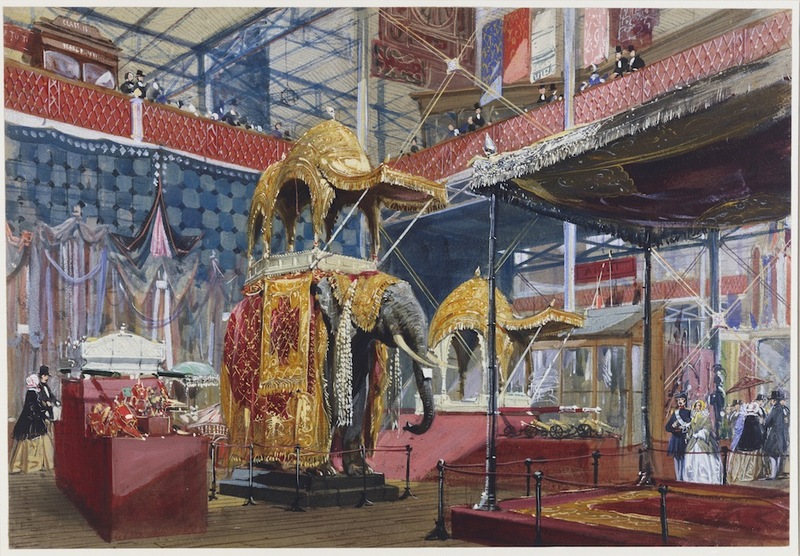 Nevertheless, Queen Victoria did express great joy and pride when the Koh-i-Noor was finally to go on public show. On the morning of the Great Exhibition she wrote in her journal, “this day is one of the greatest and most glorious in our lives . . . it is a day which makes my heart swell with thankfulness..." (219). Both she and Prince Albert had hoped that the success of the exhibition would increase the popularity of Albert, who was regarded as an upstart from a tiny German principality. Up until now, the British parliament had treated him with condescension, reducing his royal allowance from £50,000 to £30,000, and refusing to grant him a peerage. Lord Melbourne “had personally thwarted the queen's desire to give her husband the title of "king consort'” (220). In the Great Exhibition, the Koh-i-Noor was of course the central attraction, and the public was drawn to it, but not everyone was impressed. The Illustrated London News “expressed the disappointment of many: "the Koh-i-Noor is not cut in the best form for exhibiting its purity and lustre, and will therefore disappoint many, if not all of those who so anxiously press forward to see it'” (223). Every effort was made to display it to better advantage, without much success. In October when the Exhibition ended, the renowned diamond was cut to improve its quality, at enormous cost. Substantially diminished, it was placed in safe keeping. Franz Xavier Winterhalter's portrait of Duleep Singh, 1854,hanging in the corridor of the Durbar Wing at Osborne, on the Isle of Wight. On 8 March 1853, Duleep Singh, aged fourteen and still in India, converted to Christianity. Punjab “greeted the news of Duleep's conversion with grief rather than anger. The feared uprising did not occur. The behemoth truly did not know its own strength” (240). The young Maharaja was growing curious about the queen and expressed his desire to visit her in England. Arrangements were made for the long journey. Soon after he landed in England, Queen Victoria saw him and took to him at once. She wrote in her journal, “he is extremely handsome and speaks English perfectly, and has a pretty, graceful manner. He was beautifully dressed and covered with diamonds (243). Duleep became a member of the royal household, and Victoria “was deeply touched by the kindness Duleep showed her children, particularly her youngest [and sick] son Prince Leopold" (243). To do her credit, she was conscious that Duleep had had to surrender the Koh-in-Noor and felt uneasy about it, but when he met her, he only showed respect to her. Allowed to hold the gem, he bowed before her and said, “It is to me, Ma'am, the greatest pleasure thus to have the opportunity, as a loyal subject, of myself, tendering to my Sovereign—the Koh-in-Noor!!" (247). This was an informal affair, but Victoria's conscience was salved. She began to wear the legendary gem, and did so on a visit to France in 1855, when the crown with this inset jewel attracted much attention. For all Anand's efforts, the rest of the Koh-in-Noor's tale is rather anti-climactic. Victoria's prolonged mourning after Prince Albert's death in 1861 gave her little occasion to flaunt the looted gem, although she did wear it for the opening of Parliament. As for Duleep Singh, after having been allowed to visit his mother, and then bring her back and take care of her close to his own exclusive address near Hyde Park, he himself became restive: Anand tells us that in the time leading up to her death Jind Kaur “filled her son's ears with tales of his 'stolen' Koh-i-Noor," so that he "slowly changed, turning from a favourite pet of the royal court into a man who dared to defy its wishes” (258). Having married a young German Ethiopian woman who bore him several children, he tried to flee to India but he and his family were arrested in Aden. He died alone in a shabby Parisian hotel. So far as the Koh-i-Noor is concerned, by now women were thought to be immune to the misfortune it was reputed to bring, so it passed from Queen Victoria to her daughter-in-law, Queen Alexandria, who had a special passion for jewels. Subsequent consorts received it in turn, resetting it to their taste, although at our present Queen's coronation in June 1953, it was the Queen Mother rather than Queen Elizabeth II herself who wore it in her crown. In fact Queen Elizabeth II has never worn it: it stars only in the display of other crown jewels at the Jewel House in the Tower of London. So far, calls for its return to India, or to Pakistan and Afghanistan, have gone unheeded. Inevitably, the issue of the Elgin Marbles at the British Museum (and many other purloined treasures besides) comes into play here. Although neither Dalrymple nor Anand takes a strong stand on it — they are admirably objective — readers will probably form their own opinion about where the diamond should be. They will at least understand why there was a flood of protest in India in April 2016, when the Indian solicitor general, Ranjit Kumar, appeared to accept that the diamomd "had been 'gifted' to the East India Company" (280). In the end, the story of this glittering jewel is, after all, a sorry one. Dalrymple, William, and Anita Anand. Koh-i-Noor: The History of the World's Most Infamous Diamond. London: Bloomsbury, 2017. ix + 335pp. £16.99 (hbk). ISBN 9 781408 888841.